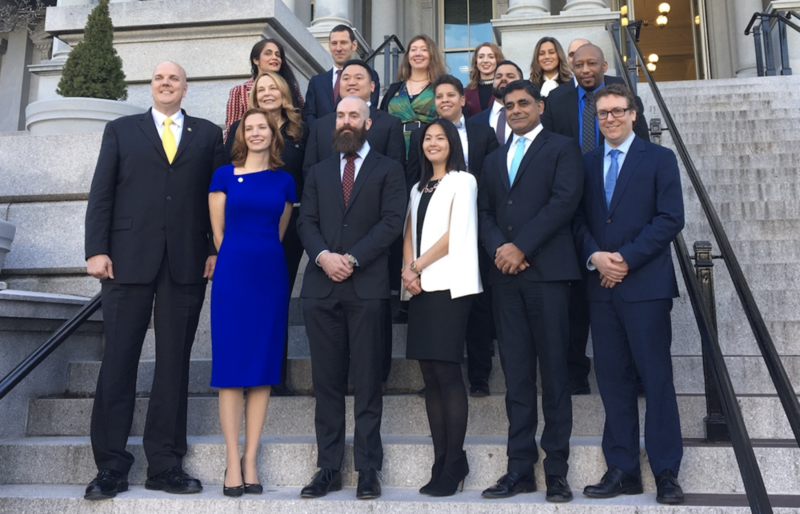 Really excited to be joining this incredible group of civic technologists looking to make a difference in government. Days for Girls (www.daysforgirls.org) is an international non-profit focused on providing women and girls with access to feminine hygiene, health education, and income-generating opportunities. I first learned about them when I was on a business trip to Guatemala. I soon learned that there are still about 300 million women around the world living on less than $1.25 a day. Without access to feminine hygiene solutions or health education, girls miss school, women can't work, and families can't effectively family plan. By providing basic solutions to a universal and age-old matter, Days for Girls is giving women time and dignity back to their lives, ultimately empowering woman everywhere to achieve more. I first learned about the organization in the spring of 2017 and instantly fell in love with the mission. They have already reached 1 million women and girls to date. I'm excited to announce that I will be joining their Board of Directors! Create and Cultivate host their Seattle conference here on the Microsoft campus. It was amazing seeing this collective of female leaders, bloggers and influencers come together to celebrate and cultivate a new generation of female entrepreneurship. Caitlin Jenner swings by Microsoft on her book tour sharing her journey. Being an Olympic athlete is no joke... She towers over me at 6'2". WE is a movement that brings people together and gives them the tools to change the world. Today, we are millions of passionate youth, women and men working together to shift the world from “me” to “we.” WE Day is an event that celebrates all the volunteering, participation and giving done throughout the year. Key Arena in Seattle was filled with over 16,000 students from all around Washington - the catch however, is students don't buy their tickets, they earn them through volunteering! The day is celebrated with a jam packed schedule of inspiring artists, speakers, performers and more. This year's lineup included Russell Wilson, Pete Carroll, Buzz Aldrin, Lily Collins, Grace Vanderwaal, Jordan Fisher, and many more! Microsoft Philanthropies supports and sponsors this incredible non-profit by empowering them with the tools and technology to scale and thrive as a social movement. As a guest of Microsoft, I even got to meet astronaut and national hero, Buzz Aldrin! As we gear up and get ready to ship Windows 10, the Microsoft JobsBlog has featured me and my team in this article - check it out! People around the globe will rely on it for countless everyday tasks — getting the latest information about a world event, gathering facts for a research paper or maybe tracking down the perfect recipe. But for those working to bring to life Windows 10’s much-anticipated new browser, Microsoft Edge, the company’s goal to innovate off previous generations of Internet Explorer and build a stronger, sleeker product offers nothing short of a chance to make history. It’s an exciting project and a defining time for about 300 software engineers, designers, program managers and people with a variety of other skills — as well as the teams they collaborate with across the company — as they look ahead to the new browser’s primetime debut when Windows 10 launches on July 29. I'm excited to be a part of Microsoft's new browser, code name 'Project Spartan'. Today, we are releasing our first preview of the browser. Coverage can be found on the Verge. As my last event serving as part of the UCLA Campus Events Commission, I had the pleasure of attending the LA Premiere of 22 Jump Street staring Channing Tatum, Jonah Hill and Dave Franco. UCLA was truly the perfect location to release such a college blockbuster. The movie was a hilarious in every way, check it out in Theaters everywhere June 13th 2014. Looking forward to the third sequel! RJ Mitte speaks at UCLA about his journey as an actor, living with cerebral palsy and how we can be kinder to one another. He shared his hardships and spoke about the importance of supporting one another. RJ is currently an activist and ambassador for the Shriners Hospitals for Children, to learn more please visit the Shriners Hospital's for Children website. We can all learn from his compassion and altruism - what an incredible inspiration and role model to all. This fall, I have the privilege of working at the NASA Jet Propulsion Laboratory as a Human Interfaces Designer. I am extremely excited for this opportunity and it is a true honor to work alongside some of the brightest minds of science and technology. I am extremely thankful for this experience and I look forward to the journey ahead. As a designer, I'll be working with the Missions Operations team in developing new software, tools and interfaces to control various robots and Mars Rovers. Prison Break star Wentworth Miller speaks at UCLA as an open Q & A. He discusses his life path to success, as well as how students can over come struggles. By sharing his personal hardships dealing with depression, being openly gay and attempting suicide at a young age, Miller sheds light on hard topics we often avoid and shares his strength and wisdom when dealing with tough times. He speaks about a world without prejudice and how we can take steps in the right direction to provide a community of support and a generation of compassion. In addition to tackling deep subjects and the hardships of the entertainment industry, he also shared his fondest memories of being on Prison Break and some of his inspiring upcoming projects. This summer, I have the pleasure of interning at Adobe Systems. I'm extremely excited for this opportunity since I've been an avid Adobe user for years now and I use products like Photoshop and InDesign on a daily basis! One of the best things about the internship is that I'll be working at their San Jose headquarters and will be able to live and experience the Silicon Valley - tech mecca of the world! I'll be working with a group of talented young designers. We are focused on bridging the gap between the consumer and the product via instructional learning content and beautiful interface design. As an intern at Adobe, I was able to get an invitation to attend the Facebook Intern Carnival. Visiting the Facebook Headquarters was amazing, I was able to see Mark Zuckerberg in person, zip-line through the campus and relish in an evening of food and games! For the third year in a row I have been awarded the Dean's Scholarship Award for the 2013-2014 academic year! I am extremely grateful for the Donors of the Design Media Arts department for their generosity and continued support towards students. I am extremely honored to have received this award all three years at UCLA. Thank you to the incredible faculty and advisors for recognizing my work ethic and progress throughout the year. The award is extremely validating to my process and passion for design, it will definitely continue to encourage me to produce only the highest standard of work I can. Thank you again for everyone that make this happen! Russell Brand speaks at UCLA about his upcoming show and his ideas about iconic figures of history and the way media shapes our perception. His engaging, hilarious and spiritual talk was extremely refreshing. His analogies perfectly capture the essence of his ideas in a facetious yet powerful way. He was one of the most captivating speakers I have seen in a long while, it was a pleasure meeting him!